Playfulness must have been part of my great grandmother’s personality. I say that because her albums have several photos that are clearly staged with elements of the whimsical. Take this one, for example, I’m pretty sure that the third woman on the back row (to the left of the woman with the reins) is my great grandmother Maude Rury nee Hilton. 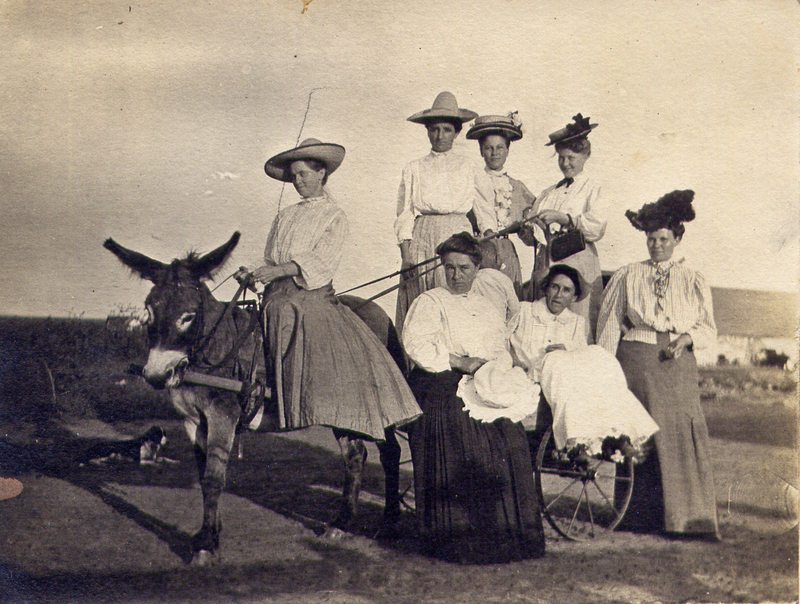 The ladies are all dressed up with hats, purses, handkerchiefs poised yet are sitting on a donkey! I suppose its the hat, the nice dress, the stiff posture and riding a bicycle/donkey, which are things that just don’t seem to go together. This photo wasn’t taken in Kansas, rather it was probably taken near Ponca City, Oklahoma between 1902 & 1912. You can see the very flat land with some buildings in the background. I think the photographer’s message, just like The Oz, was “Pay no attention to that” boy behind the woman holding her hat or the dog just behind the donkey. Do you see them? I presume the boy is there to control the donkey just in case it were to take off. 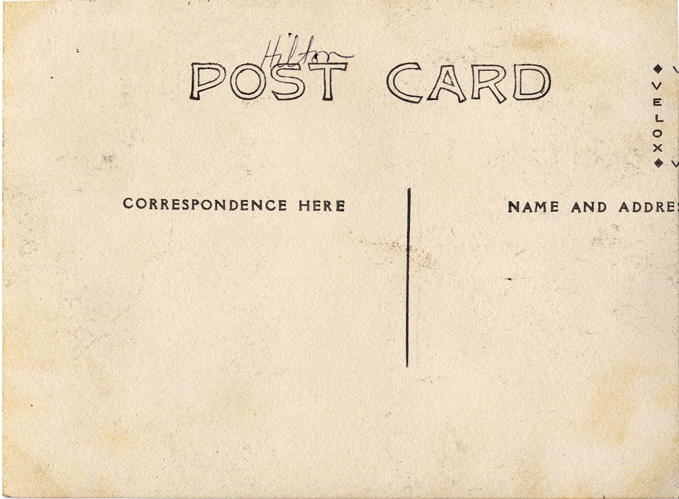 As you can tell from the back of this 3.5″x 4.5″ postcard, it was never mailed and I believe I’m the one who wrote “Hilton” on it. This postcard is one of a series of two, the other one has twelve children in similar poses but somehow the scene does not remind me of Dorothy and doesn’t seem as, well, whimsical. This is my submission to the 5th edition of A Festival of Postcards, Quadrupeds. From working animals (like oxen and horses) to pets (like cats and dogs) to wild animals (lions and tigers and bears, oh my!) – we’re looking for postcards about anything that walks on 4 legs! That’s cute. You’re right; Grandma Rury did have a touch of the whimsey, which is likely where Grandma Brown picked it up. 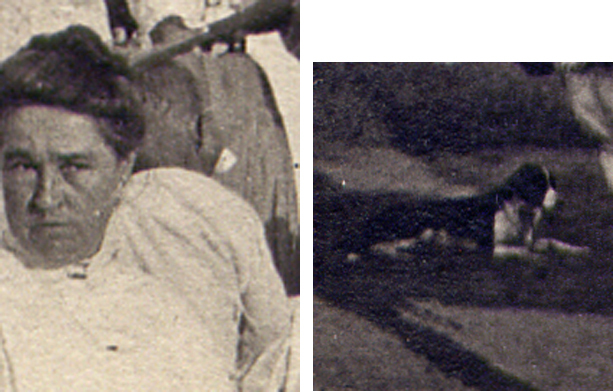 Grandma Rury was never a typical grandmother of the period. (and likely not a typical girl, young women, wife or mother). Great postcard, K! I love looking at the photos of your grandmother, and this one is especially whimsical. I need to go through more of her photos to show some of the artfulness I see in them. Thank you for visiting. I did spot the dog, but you must have very sharp eyes to have spotted the boy! Hopefully, you were able to see the boy. His hair is shaved and he’s turned away from the camera so you do not see his eyes but can see one of his ears. He’s sitting just behind the woman to the right of her shoulder (when looking at the postcard). I actually saw the boy before the dog because I was focused on trying to figure out who the people might be. I’m so glad you visited.